What a great time we had! This is becoming one of our very favorite yearly events. This year we expanded our visibility by having two booths instead of one. We have so many different items that it's becoming virtually impossible to fit everything on a single table. We drove down to Seattle on Saturday the 28th and arrived at the Seahawk Stadium around 2:00pm. 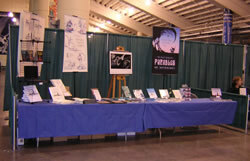 We spent a few hours putting our display together and chatting with some of the other artists and publishers. Once the booth space looked to our satisfaction, we left the hall and drove around downtown Seattle in search of a hotel. We settled on the Warwick, a high rise hotel that provided us with an excellent view of the city. After a wonderful meal at the hotel's restaurantl, we went up to our room on the 14th floor to relaxed. We knew that Sunday would be hectic so we wanted to be nicely rested. Well, fat chance of that. It seems that every time I do a convention, my synapses are in overload and I just can't sleep. I pretty much looked at the ceiling for 8 straight hours. On Sunday morning, we caught breakfast at the hotel before driving to the convention hall. Once inside, we did some last minute adjustments to our display and I took the opportunity to do some quick shopping before the crowd came in. The doors opened at 10am and things got rolling right away. We had six Demon Dog Rabbit Statues on the table. Within the first two hours, they were gone. Parables: An Anthology was a big hit. We sold all the copies we brought. Fans were very eager and enthusiastic. I sketched for everyone who bought books and then some! 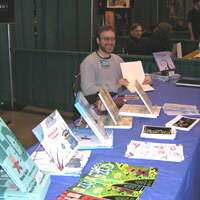 Many artists stopped by and asked questions about breaking into the industry which I tried answering the best I could. I was glad to finally meet Stan Sakai (creator of Usagi Yojimbo) who came by our booth. Stan and I are currently collaborating on a small project and it was nice to be able to see each other in person. Business started slowing down in the last two hours but we didn't mind, we were exhausted! We knew that our sales had already far surpassed the previous year. I used the breather to walk around the hall to do some last minute shopping while Nancy, my soul mate, held the fort. I was glad to find a bunch of really good deals on some old Kirby monster comics. I was particularly happy to finally get a hold of Where Monsters Dwell #1 and #2 which were missing from my collection. At 5:00pm the doors closed. A quick overview of our inventory revealed an increase in sales of about 50% over last year's event. We were happy. After the convention, we hooked up with our friend Jeff Nicholson, the extremelly talented artist behind the critically acclaimed comic series Colonia. Nancy, Jeff and I headed to the Icon Grill Restaurant in downtown Seattle where we had yet another exquisite meal. We met Jeff last year at the San Diego Comic-Con and we really like him. He's such a nice guy. Next year will be a two-day event and we're definitely planning on being there again.